Fear not pastry fans of Old Ottawa South, the so-called Pie Lady has not left the neighbourhood. 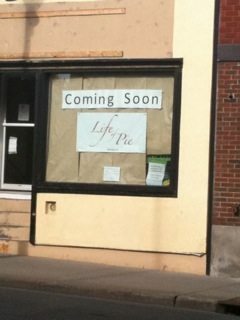 Yes, she closed her plucky little pie bakery on Leonard Avenue last week, but this morning at 8 a.m. Kerry Duffy re-opened Life of Pie in its new location at 1095 Bank Street, two doors down from John Taylor’s wine bar Genuine. According to the Life of Pie facebook page, visitors can expect to find scones, muffins, and coffee as well as cookies, brownies, soup, quiches, and — of course — pies.